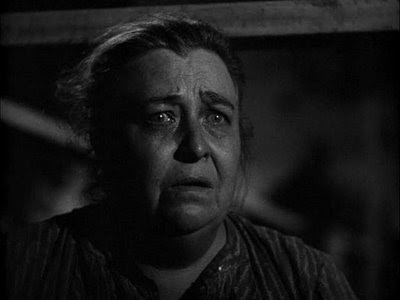 The Grapes of Wrath (1940), directed by John Ford, is a classic American film based on a classic American novel by John Steinbeck. Ford helmed the picture with the amazing Gregg Toland serving as cinematographer. (Toland was the best director of photography of his era; he shot Citizen Kane, as well.). 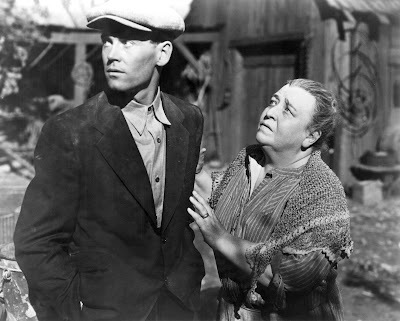 Henry Fonda and John Carradine are wonderful in their roles as Tom Joad and Casy, but the real star of the film is Jane Darwell as Ma Joad. Her Oscar for the role was well deserved. The scene in which she effusively casts aside her personal possessions and mementos in preparation for the westward journey is one of the most moving in cinematic history. It's enough to make the most cynical blogger capable of human emotion. Trivia: IMDB quotes Darwell: "I've played Henry Fonda's mother so often that, whenever we run into each other, I call him 'son' and he calls me 'Ma', just to save time." If you've not, see this film immediately. Sadly, this film only reminds me of an opportunity to sleep in HS English class. We watched it after reading the book, which I did read and did not sleep through. Oh my, Kristiane, this film is fantastic.